The Red Bulls finished the Mexican leg of their pre-season with a 3-2 loss against Chivas de Guadalajara. RBNY was up 2-0 at the 71 minute mark, but couldn't hold out against the Mexican giant. Among the many bright spots in this one, was brilliant play of Dane Richards, who continued his fine 2010 season form with a golazo and an assist on Juan Agudelo's tally. You can click here to watch the highlights or click here to see the game in it's entirety. It looks like Rafa Marquez will be playing center back for the Red Bulls this upcoming season. A Marquez/Ream center back combination will definitely strengthen the RBNY defense, but leaves the question open: who will run the Red Bulls midfield? Mr. Backe believes the answer is Tony Tchani (scroll down the linked article). One new RBNY item that had me jumping through hoops this week is Mr. Backe saying that the 3rd DP could be a Creative Midfielder. Has the man finally seen the light of day? Well, he made a statement to the effect that if he was going to buy a good player, it would be a central midfielder, who could feed the strikers. Yeah, it sounds like he's in the market for a star Creative Midfielder, and it's about time. Fitness & Pace, without creativity in the middle, will only get you so far (in my humble opinion) and it probably won't get you an MLS Cup victory (unless, of course, you're extremely lucky - like Colorado). And speaking of our great Norse leader, he believes it's more important to win the Supporters Shield than the actual MLS Cup. I'm afraid I'm going to have to disagree with him on that one, but whatever. Also, he's just named Thierry Henry the new RBNY captain. The star player linked with RBNY this week is none other than AC Milan midfield maestro Clarence Seedorf. Could this be the creative midfielder Mr. Backe wants to bring in? I, for one, certainly hope so. 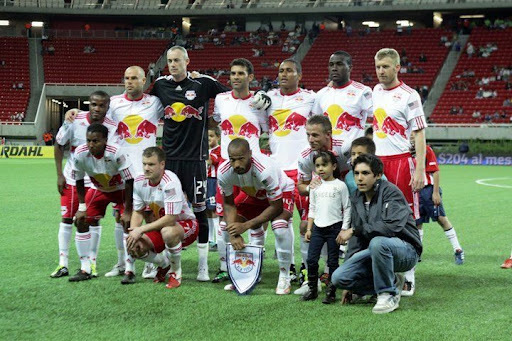 Red Bulls Managing Director Erik Stover is looking to build on the successful 2010 campaign. Sponsorships are up, concession sales are up and Mr. Stover is optimistic that season ticket sales will reach the 10,000 mark. But what about that local TV deal? It was announced today that the League has reached an agreement with Fox Soccer Channel for national broadcast rights. This one year agreement is, reportedly, worth $8 million [Ed. - Sports Business Journal and Alexi Lalas have now reported the agreement to be worth $6.25 million, far less than the league was asking but still higher than the previous deal.] One Red Bulls game has been moved due to the new FSC agreement. The Red Bulls have earned an automatic US Open Cup berth. Their 2011 USOC campaign won't begin until June 28th. Get your Thierry Henry Wallpapers here. The beautiful new 2011 RBNY blue away jersey is now available for purchase. The color has been a bit of an issue with RBNY fans, as the shade of blue is so dark, it looks almost black. I like it! A cool Red Bull Arena construction timeline can be found here. For those of you who park in Harrison residential streets during home games, it will be tougher this coming season.